Three years ago, I moved about a mile down from where I used to live. Don’t ask why I’d move a mile down the road, it’s a long story and not really relevant to what I’m about to tell you. Anyway, I moved and immediately, my new neighbors all welcomed me in the same fashion you used to see on old TV shows like Leave it to Beaver. I had lived on this very road for 10 years, and only one person had even noticed my arrival. But I move a mile down the road, and I get adopted into a farm family by people who are technically my neighbors, but if I wanted to drop in and visit them, I’d have to drive because I’m too lazy to walk that far. After years and years, I finally hit the neighbor jackpot. I was on the receiving end of home cooked food, party invites, and random friendly visits. I loved all the neighborly visits, but the ones I most enjoyed were from Joe. Joe was in his 80’s, I think, and he’d drive over in his Subaru. I knew he couldn’t get around all that great, so when I saw him pull in, I’d run out to the driveway and chat with him while he sat in his car. Joe always made me laugh and his visits were a welcome distraction from the mundane household chores that were usually occupying my time. I’ll never forget that one morning in December, just a few days before Christmas. I was a stay at home mom at the time, the kids were all home on Christmas break and I was trying to enjoy a morning of sleeping in, when I felt the dog putting her paw on my head, telling me she wanted to go out. I tried to ignore her, but she kept pawing my head and whining. Grudgingly, I got out of bed, and for some odd reason, I just happened to look out the window before heading to the door to let her out. As I looked out the window, I couldn’t believe what I saw. My first thought was that I was in some sort of dream state and I just thought I was awake. I turned my back from the window, waited a few seconds, and turned back around. 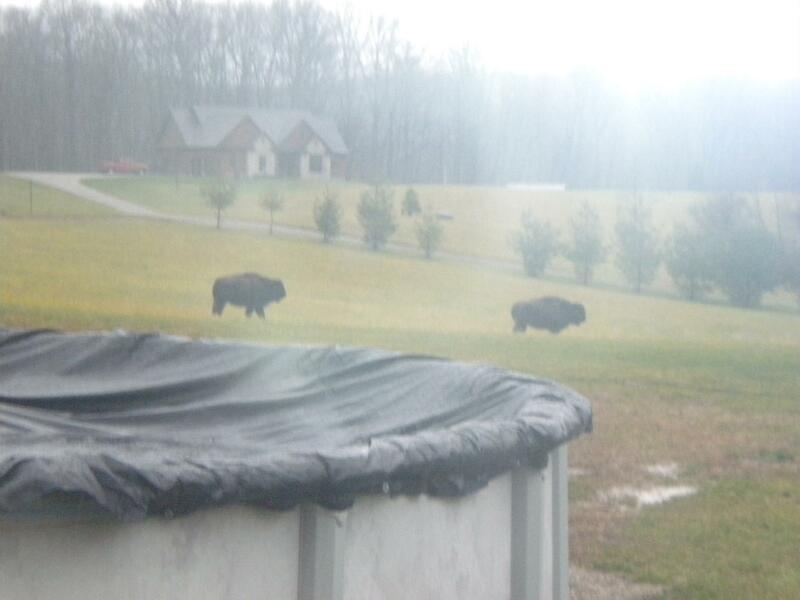 They were still there – two very large buffalo* were just casually grazing on the dead grass right in my backyard. I didn’t know whether to pick up a phone or a camera. Luckily, I did both. I grabbed my cell and snapped a few pictures from the window. Then I picked up the phone, but I wasn’t exactly sure whom I should call. After a minute of thinking, I dialed Joe’s number. He owned a farm; it seemed the most logical choice. “No, Joe, I’m sure they aren’t cows,” I replied. “Oh, you know, Sharon has horses. I bet Sharon’s horses got loose,” he said, matter of factly. “NO!” I exclaimed, “It’s 9 a.m.! I don’t drink until after 5 p.m. I swear!” Apparently, there’s a nasty rumor out there that I enjoy a cocktail or five every now and then. And quite frankly, after the week I’ve had, I may just very well start drinking at 9 a.m., but that’s neither here nor there, and I certainly wasn’t doing that on December 21, 2011. Since Mr. Joe thought I was a stark raving alcoholic lunatic suffering from hallucinations, I did what any reasonable person would do and posted my buffalo pic to Facebook and asked if anyone had lost any buffalo. Later that day as I strolled the aisles of The Krog, doing my grocery shopping, I got 800 phone calls about the damn buffalo, including one from the local newspaper, who promptly did a story about the stray wildlife in my yard, complete with my photographic evidence, which eventually led to the owner of the missing buffalo. Luckily, the buffalo owner was able to capture his two wayward half-ton babies and corral them safely into his new buffalo farm 1.5 miles down the road, and minus that one lapse in judgment I haven’t had any more dealings with stray buffalo. *Yes, I know they are technically bison, so spare me the know-it-all emails. I chose to use the term buffalo in exercising my creative liberty and as homage to my redneck roots. ← Mother of the Year. Not!